Headed off up to the Yorkshire Sculpture Park for some photography and it rained! The weather was dismal – drab grey sky and rain. First stop was the YSP cafe for home cooked chips and a hummus & olive wrap, followed by scones with cream & jam…yummy! I used my infrared converted Pentax *ist D and a 28mm f/2.8 lens for today’s photography. No tripod, flash or filters. I was lucky enough to catch the back end of the exhibition by Spanish artist Jaume Plensa. A few of his statues were still on display in the grounds, sadly I missed the indoor exhibition as that closed on the 22nd. A long overdue overall of my TV aerial meant an old aerial was taken down and the house rewired to a new more powerful one. 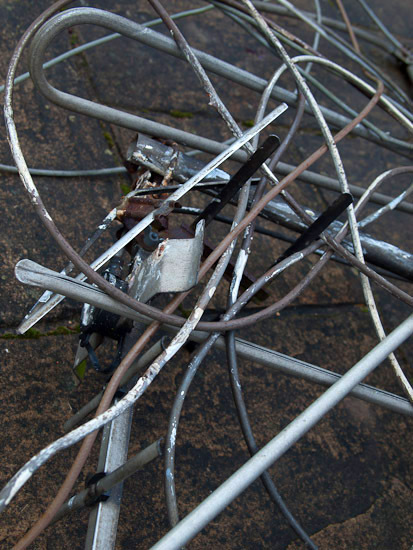 The signal on my TV is now wonderfully tuned…and the old aerial is ready for the skip. As it lays there I cannot help seeing an abstract art work in it. So a cropped shot with all the cable strewn over the top has provided the abstract view for my photo of the day. It won’t win awards, but neither will many of the swirly surreal paintings it reminds me of. Perhaps if I colour in the shapes it will become a work of art!